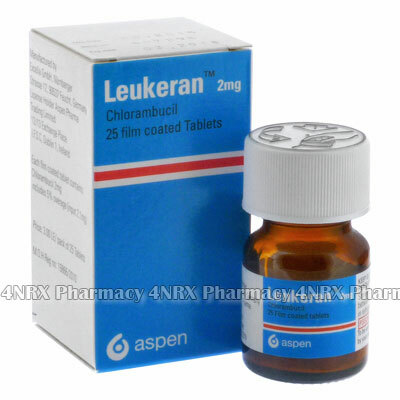 Leukeran is an anti-cancer drug containing the active ingredient Chlorambucil. Chlorambucil is used to treat patients with leukemia and lymphoma. It is classified as an alkylating agent. Luekeran works by slowing or stopping the growth of cancer cells. Leukeran can also be used in certain situations to help treat certain blood disorders or kidney problems. How should I use Leukeran (Chlorambucil)? Leukeran is sold as a bottle of 25 x 2mg tablets. A starting daily dosage of 0.1mg to 0.2 mg per kg of body weight is often prescribed, however dosages may vary between patients sue to factors such as weight and treatment response. Leukeran is usually taken for a period of 3 to 6 weeks. Leukeran is an oral tablet. What are the side effects of Leukeran (Chlorambucil)? If you notice any of the above side effects while taking Chlorambucil, contact your doctor immediately. Leukeran must only be used in chronic cases of lymphatic leukemia or malignant lymphomas. Chlorambucil is a carcinogen. Convulsions, infertility, leukemia, and secondary malignancies have been observed when chlorambucil was used. Chlorambucil has been known to damage chromatids or chromosomes in humans and to cause both reversible and permanent sterility in patients of both sexes. Leukeran a Pregnancy Category D medicine. It can damage the fetus if administered to a pregnant woman. Make sure your doctor knows if you are pregnant or trying to become pregnant. In case of accidental pregnancy while taking Chlorambucil, contact your doctor as soon as you become aware of this. Breast feeding is not recommended while taking Leukeran as it may be passed to the baby through the milk. Leukeran can decrease the number of lymphocytes and neocytes in the blood, which can lead to irreversible bone marrow damage. If being treated with chemotherapy or radiation allow at least 4 weeks to pass before using Chlorambucil.